It’s hard to precisely pin point the style of designer Peter Dunham. The LA Times used the term “Merchant Ivory modern,” which is certainly apt but doesn’t quite tell the whole story. 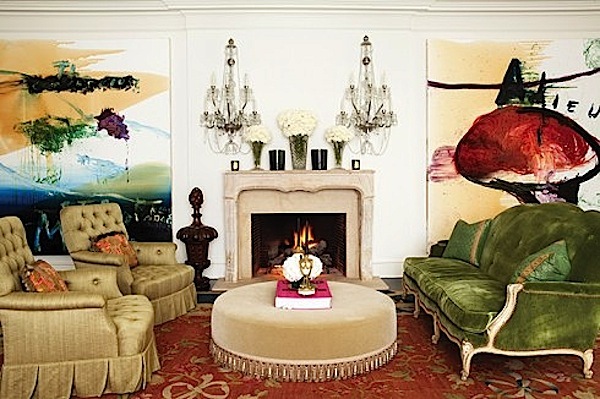 With a background almost as eclectic as his designs, Dunham’s aesthetic encompasses quite a bit of territory. A childhood spent galavanting around the globe with stylish sophisticated parents honed his eye and whet his appetite for both travel and design. With a series of pedigrees including an Oxford education and internship at David Hicks, Dunham has both the knowledge and sixth sense for creating distinctive interiors that marry exotic influence with LA comfort. We are delighted to welcome Peter Dunham for our latest Stylish Shopping episode. Join us for an afternoon of wit and whimsy as Susanna shops with the very delightful designer at his favorite Los Angeles design haunt, JF Chen. After living in NY for 15 years, Dunham moved to Los Angeles in 1998 and launched his design career. Soon thereafter, he found a demand for the textiles he was having made for his jobs. Combining his love for exotic prints with a Mediterranean flavor and vintage flair, a fabric collection was born in 2005. Starting with John Rosselli’s NY showroom and now in many others around the world, the textiles triggered the need and desire for a retail space where design services could be offered alongside products. 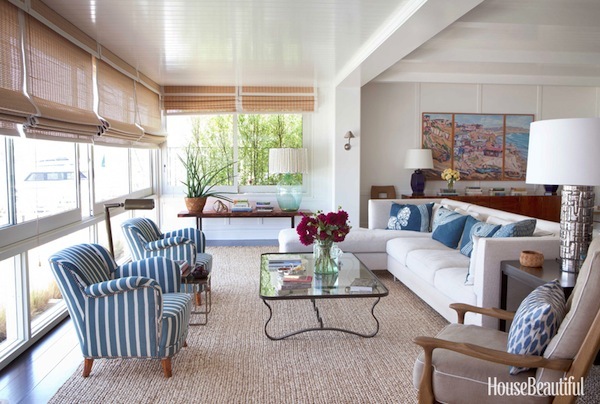 So in 2007, Dunham opened Hollywood at Home, which has since become a go-to design destination for not just textiles (including the collections of friends and colleagues) but also custom furnishings and unique vintage finds. Clients range from understated families to Hollywood royalty, all of whom come to Dunham knowing he’ll conjure up just the right mix. His laid back style belies a great understanding of history and design that results in a casual chic with great bones and a healthy dose of personality. 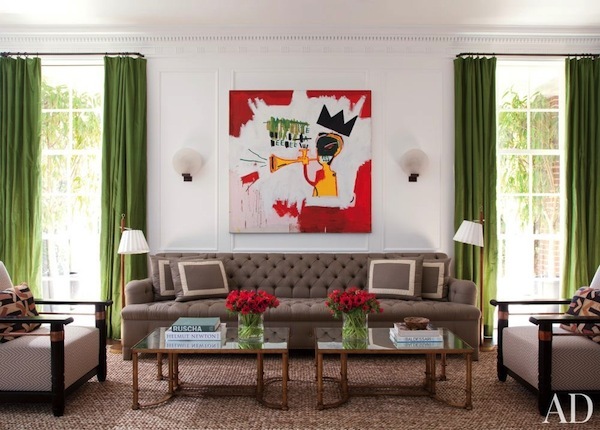 Steve Tisch’s Beverly Hills living rooms feature unexpected combinations that work, from the bold Basquiat to the well mannered custom tufted sofa, to the vintage French cocktail tables. In a Mediterranean-style stucco house, Dunham added a fresh dose of cool cottage chic with a modern sofa, pillows of vintage Japanese textiles and a Royère French 40s coffee table. And it’s the fact that Dunham can construct such a pairing shows his talent for “getting it.” Thanks to Peter for a charming and enlightening day! This entry posted in art, design, furniture, interior design, Quintessence video series, Stylish Shopping, travel. 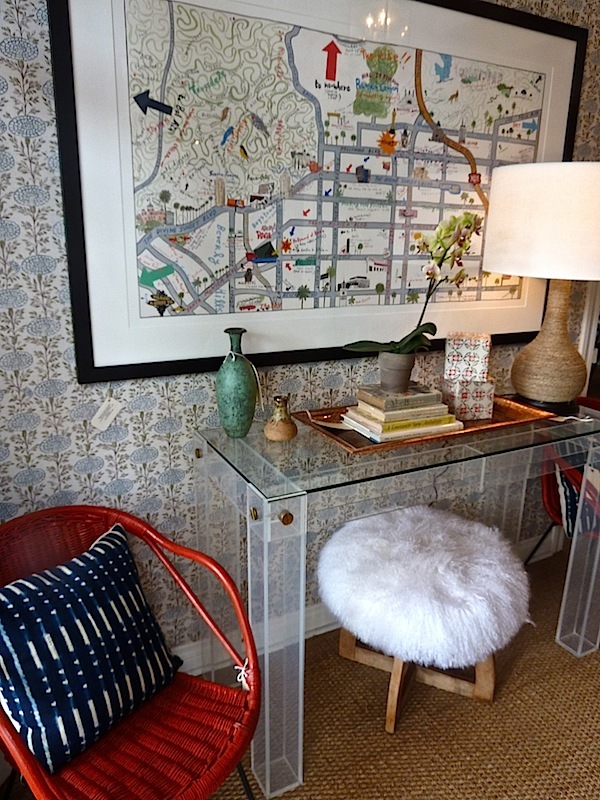 Entry Tags: Decorating, interior design, Peter Dunham, Shopping in Los Angeles, Stylish shopping Bookmark the permalink. super well done, LOVE him. A delightful segment Stacey. You do not have to meet Peter to adore him! The space Susanna toured with him is amazing beyond! Fun! We’re big fans of Peter’s style and this video series gives us a great peak into his process. Hope you had fun last night! So fun, just catching up here…adore Peter’s style! “Merchant Ivory Modern” is such a great term…gotta love the Times…and these videos! LOVE Peter’s Thinking about STYLE !!! Peter understands everything! About Good Taste. Love the place … What a collection of art pieces and mirrors ….loved it . WOW! I don’t think there’s anywhere in the world where ALL pieces are that stylish! 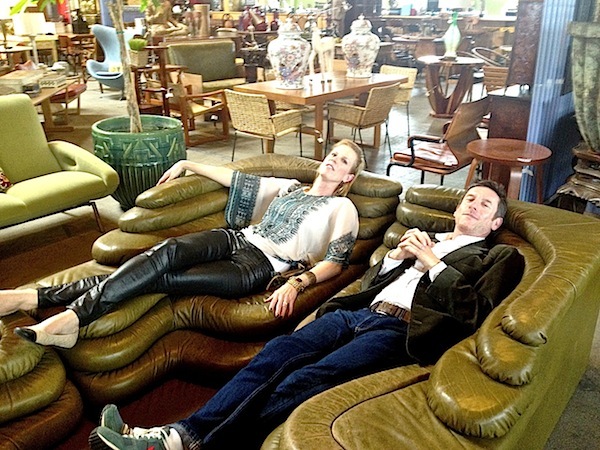 What are those wonderful green couches? They are fantastic! I met Peter through my Parish-Hadley mentor, the late Tice Alexander. Peter is very chic, and had a great flat in New York. Christopher Mason would sing for us, and Carolina Irving and Daniel Romualdez were also part of the coterie. Peter made the best guacamole for our Fire Island summers, and I still recall watching him fly off with Tice in a sea plane from the East River -such fun! 84 queries in 1.202 seconds.